One of the most intriguing aspects of the Bible is the fact that it evinces a creation “out of nothing.” Creation, it seems, comes out of nowhere. We have no idea why God creates the world. We only see the fact of creation (as the expression of God’s radical freedom). And this turns the will of the creator as well as the creation into a mystery. What follows from creation, however, is sometimes less a mystery. Many characters in the Bible, for instance, are archetypal. They rise and fall. They go from innocence to experience. And there is a lesson to be learned. However, although the story of someone’s journey from innocence to experience is typical, the mystery of creation offsets this journey because it suggests that we may not know why someone has to go through this transition; perhaps it, too, is a mystery. Drawing on the myth of the creation out of nothing, the beginning of Bernard Malamud’s first novel – perhaps the best novel ever written on baseball – The Natural marks the beginning of an American life from out of the darkness. Roy Hobbs, the main character and first word of this novel, comes out of nowhere. He is a mystery and each of his movements, at the outset, is shrouded in mystery. Malamud suggests that Hobbs has a kind of mystical vision of a boy who plays baseball, a boy that emerges out of a vision of sorts. The house is “alone in untold miles of moonlight, and before it this white faced, long-boned boy whipped with train-whistle yowl a glowing ball to someone under a dark oak, who shot it back without thought, and the kid once more wound and returned”(3). The scene is mythical because it is “unique” and happens over and over again. 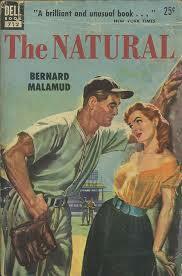 Malamud, here, suggests that in America baseball has a mythical core. The ball is caught up in a kind of Nietzschean eternal return. And while Roy is aware of this vision, he finds something problematic about it since it reminds him of a confusing dream. Roy shut his eyes to the sight because if it wasn’t real it was a way he sometimes had of observing himself, just as in a dream he could never shake off….of him standing in a strange field with a golden baseball in his palm that all the time grew heavier as he sweated to settle whether to hold on of fling it away. I would like to suggest that we read this in terms of a mythological sequence. The confusion about the window indicates that Hobbs is and is not damaged by the elements outside the train of birth. He is protected by the train – which throttles through the landscape – but Malamud wants to point out that the movements of the train make Hobbs thirsty and hungry. Hobbes dream, in other words, is not pure. It is tainted by hunger and the desire for movement. And this, as the novel goes on to show, will lead him to make reckless gestures. What I like about Malamud’s creation of Hobbs is that he is a mystery of American creation whose childlike dreams are tainted by the wild and free movements of an American train through the primitive landscape. It suggests that Hobbs’ struggle with failure and success – which we see throughout the novel – are born out of his relation to the American journey. He paws at the window and scratches at the match behind the window with his thumb. He has primitive beginnings. His vision comes out of the flowing landscape, but it also passes away and leads to hunger. His childishness or primitiveness, which he brings to the game of baseball, is constantly in the background of everything he does. It marks a kind of innocence that, for me, is of great interest because Hobbs has many qualities that are shared with the schlemiel. What Malamud has managed to do is to depict an American myth that is caught between visions of success and the reality of failure. Hobbs is a “natural.” He emerges out of the landscape. But, at the same time, he is not a natural. He is pawing at the window, but from behind it. He imagines that nothing separates him from his dream and that he can become a hero. But in reality, this dream is unnatural and has devastating consequences. The American dream, Malamud seems to be telling us, comes out of something primitive and seemingly natural, but it, like the schlemiel, has its blind spots. The twist, here, is that Hobbs is not a comical figure but his innocence and blindness are. His dreams, as they overshadow reality, have a tragic-comic feel only because they are so innocent. They emerge out of the mystery of creation…Ultimately, Malamud seems to be suggesting that his innocence, his dream, and his birth out of nothing – like America itself – are a mystery.